Boulevard beers have officially arrived in Ohio. Based out of Kansas City, Boulevard was purchased by Belgium’s Duvel Moortgat in the fall of 2013. Duvel also owns Brewery Ommegang in Cooperstown, New York, and the combined sales of Boulevard and Ommegang make Duvel the 8th largest craft brewery operation in the US. When the acquisition happened I figured wider distribution of Boulevard would follow. So I was not too surprised when it was announced that Boulevard would be coming to Ohio. The initial round of Boulevard beers to hit the shelves include Pop-Up Session I.P.A., Single Wide IPA, 80-Acre Hoppy Wheat, and Unfiltered Wheat. I’ve tried their IPAs and wheat beers in the past and if my memory serves correctly they are good, but it is not exactly like we are hurting for more beers of these styles. On the other hand, the beers in their Smokestack Series are worth a closer look. Those include The 6th Glass Quad, Dark Truth Stout, the Grateful Dead themed Long Strange Tripel, and my personal favorite Tank 7 Farmhouse Ale. 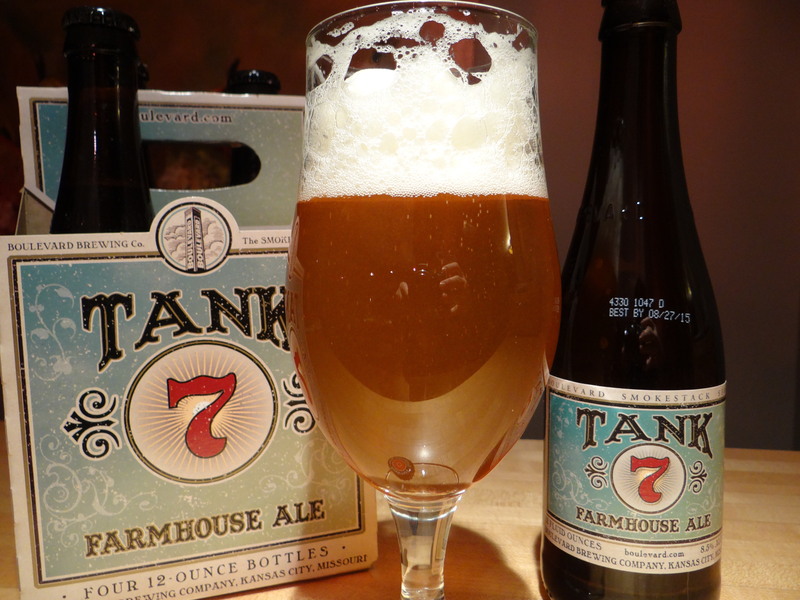 To celebrate Boulevard’s launch in Ohio I picked up a 4-pack of Tank 7 tonight and used my tasting notes to revise a review that I posted in the early days of the blog. The bottle is imprinted with a best by 8/27/15 date, so it’s safe to assume this is a fresh bottle and the hops should be in full bloom. The first thing you notice on pouring is the immense amount of eggshell white head that fills the upper half of the tulip glass. The massive head and effervescent nature of this beer comes from the bottle conditioning, and in my experience those are typical attributes of many Boulevard beers. The use of wheat is no doubt is partially responsible for the excellent head retention. With some patience the head recedes leaving behind extensive lacing on the walls of the glass and dense islands of foam floating on the hazy golden colored liquid. Picture islands of meringue floating on a sea of translucent honey. The aroma is an enticing blend of lemony citrus notes from the hops, fruity esters (bananas?) and spicy phenolics from the yeast that lend a complex funkiness that is beguiling but hard to describe, there is also some sweetness from the malts. The taste starts off with the nice bready malt flavor of a pilsner, but is soon hijacked by citrus and spicy black pepper. The finish is fairly dry with the slightest hint acidic/sour flavor, and surprisingly bitter for a Saison. The mouthfeel is simultaneously thick and effervescent. Check out the impressive lacing that the billowing white head leaves in its wake. Not only is Tank 7 is one of the hoppiest saisons I’ve encountered, the use of citrusy Amarillo and bitter Bravo and Magnum hops makes for a unique take on the style. I love the interplay of hops, yeast and malt to give a complex, unique beer. 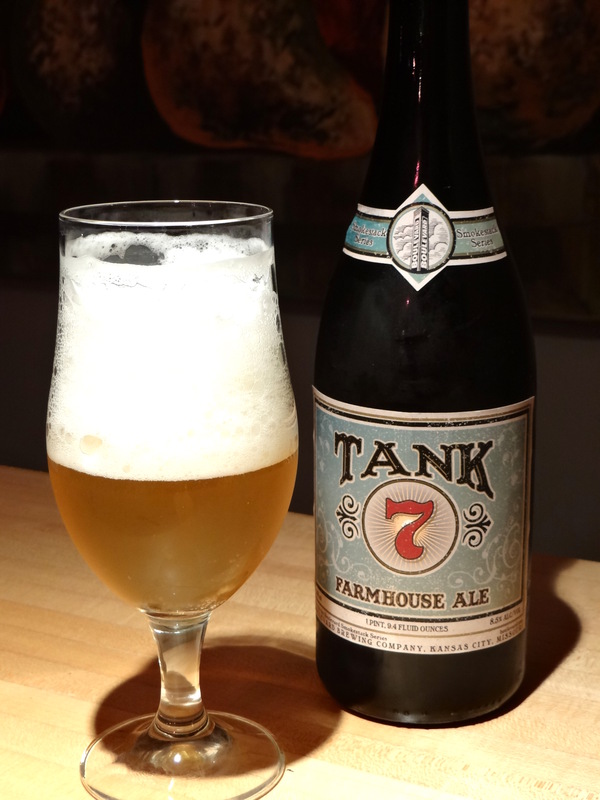 If you like Saison Dupont and other hoppy saisons, you should definitely seek out a bottle of Tank 7 at your earliest opportunity. It’s an American classic that is great for pairing with food or drinking on its own. Welcome to Ohio Boulevard!